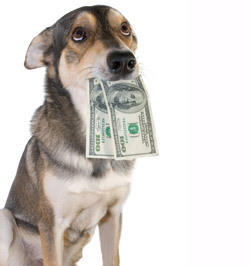 Bill Fry - the pre sident of one of the football clubs in West Seattle - said that his dog ate 1200 dollars. Fray said that after returning home, he saw on the table a banknote of fifty dollars. At first he thought that this banknote is a forgotten part of his savings, but later he realized that here is an entirely different matter. Trying to find an envelope in which he saved the money donated by parents of those children who were the members of his club, he was unable to detect it. In the envelope there was kept one thousand dollars and a half: 600 dollars in cash and 900 in checks. Some time later, Bill found 300 dollars. They were buried in the yard. And those fifty dollars, most likely were dropped out of the same envelope. Other pieces of banknotes were found by the "lucky" owner in the waste of his dog Cosmo. This dog is five years old and he is a Labrador and Shepherd mix. Money that were in an envelope, Fry collected for the needs of the club. He said that he will refund 600 dollars eaten by his dog, and hopes that those parents who wrote their checks for the first time, will not refuse to do it once again.